This section of the blog presents a message of Bhagawan Baba every week. Mostly, it is the form of a question that is answered by Bhagawan, giving us the correct understanding and interpretation of a concept or a term or a practice. So watch out every week for a special message from Bhagawan Baba that could serve as our driving force throughout the week. Wish you a happy week!! The audio clip of the message has a name that adopts the following code: Title relating to the message, Duration of the clip, Year-Month-Date of the Clip. Below the title is the English translation of the message. Below the English translation is the audio player. How can we destroy our bad qualities? Shreyo Hi Jnaanam Abhyaasaat...you need to learn everything by practice. Everything comes by practice alone. Walking, talking, reading, writing, eating: everything comes by practice. We need to undertake this practice in our daily life. But we must practice truthfully in the right way. We must not practice bad things. To do bad things we do not need any practice. A boulder on the top of the hill, if kicked by the leg, will come rolling down. But to take a boulder from the bottom of the hill and place it on the top is very difficult. You do not need to practice for nurturing bad qualities. You all know that even a bus or a lorry with full load makes so much noise while climbing up the mountain. To move upward takes lot of pain. But to slide downward is very easy. We must not make an effort for doing easy things. Even if it is difficult, look up. Low aim is crime. Do not commit a crime. Look up. We must develop a high aim or lofty vision. That is true Sadhana (spiritual exercise). How do we illumine our spiritual heart? Here is some wood. What will happen if this wood is put into the fire? The wood will disappear. It will get transformed into coal. The wood is gone and we now have coal. When we touch the wood it does not make us dirty but when we touch the coal it makes us dirty. How can we make this coal look white again? Ignorant ones will wash the coal with soap to make it white. If the soap is used to wash the coal, the soap too will become black but the coal will never become white. Even if take the coal and wash it with milk, the milk will turn black but the coal will never turn white in colour. What do we need to learn from this? First of all how did this coal get formed? Why did it get formed into coal? It got transformed into coal because of the contact with fire. So put the coal into the fire again. It will continue to burn in the fire until it eventually gets transformed into white colour. When the wood is half burned it becomes coal. When it is fully burned it becomes light. Therefore, in a similar manner part time devotion will make you like coal. Full time devotion will make you light. Put it into the fire of love. It will continue to burn and will become ash that will fly away when blown. See, here is the wood. When dropped, it falls down. But after burning for long it becomes ash; the ash will just fly upwards when blown. The lighter it is, the more the height it will reach. The more the weight, the lower it will descend. Therefore, if you wish to reach great heights then you need to reduce the weight: less luggage more comfort. As the weight is reduced further and further, it will become lighter. Hence, we need to progressively cut down our desires. It is not enough to just reduce our desires. We need to reduce the bad qualities of Raaga (attachment), Dwesha (hatred) and Asuya (jealousy). Why? Because there are three powerful enemies: Kaama (desire), Krodha (anger) and Lobha (greed). Desire destroys devotion. Anger destroys wisdom. Greed destroys our actions. Thus, these three destroy the triad of action (Karma), devotion (Bhakti) and wisdom (Jnaana). When we get angry we lose all our wisdom. We lose our discrimination power. It will bring about enmity and we would lose the discretion power to decide what to talk: when and where. Therefore, we should not get angry. We should never become greedy. The disease of cancer may be cured but these three enemies (desire, anger and greed) can never be cured. How do we then get rid of them? When they are put into the fire of Divine Love they will turn into ash. Even very hard metal when put into fire burns and turns into liquid metal. When iron itself gets transformed into liquid will not these bad qualities get destroyed? Thus we must first destroy our bad qualities. What are the four types of lights that illuminate our lives? The moon gives us light at night. The sun gives us light and bright sunshine during the day. Dharma illumines and gives light to all the three worlds (gross, subtle and causal). A good son (daughter) gives light to the entire family. The bulb at home sheds its light only within the confines of the room. The moon at night sheds light everywhere but it is dim light. However, the sun which shines during the day sheds its bright light all over. The light at home symbolizes “Svaartham” (selfishness). The moon which sheds its light everywhere symbolizes “Paraartham” (selflessness). And the sun symbolizes “Yadaartham” (Truth). Truth is God. Therefore, the sun that sheds its bright light everywhere is the True God. That is why since ancient times the Bharatiyas worshipped the Sun. The performed Surya Namaskaaraas (obeisance to the Sun deity). They verily regarded the sun as their God. Life is sustained on this earth because of the sun. Therefore, what we need today is the light of the moon during the night, light of the sun during the day, light of Dharma in the three worlds and light of a good son (daughter) in the family. One cannot become a good son (daughter) merely by getting educated or by acquiring titles. One needs to have good behaviour, good manners, good discipline and good devotion. This is most important. If there is devotion all good things will come to you. Who is an ideal son or daughter? Who is a good son (daughter)? Good son (daughter) means God son (daughter). Good is spelt as G O O D. This entire world is illusory and is equal to a zero, whereas Brahma is the Truth. Remove the ‘zero’ representing the illusory world from GOOD (i.e. remove one letter ‘O’) and we are left with GOD. When one zero (letter ‘O’) is removed from GOOD, it becomes GOD. Therefore God son (daughter) is Good son (daughter). That is, a good son (daughter) must always have Godly (Divine) feelings, must engage in Divine actions, must nurture Divine thoughts and exhibit Divine behavior. ‘Su’ means ‘good’. A good son (daughter) must fulfill the commands of the parents, receive the love of the parents, make them happy in return, express gratitude to them for having nurtured and brought them up all these years and satisfy them. Not only that, he / she must also get a good name in the society. When does one become a good son (daughter)? Similarly, even if there is one good son (daughter) in the family, the whole family / clan will earn repute and the son (daughter) will also get a good name. These days as soon as a child is born we distribute sweets and celebrate. When asked why one is distributing sweets, he / she answers, “O! I have begotten a child”. But only time will show what type of child it is. Just by begetting a son (daughter) we must not declare that we have got a son (daughter). The day when that son (daughter) gets a good name in the society, that day you can celebrate the birth of your child. A father will not experience true happiness when a son (daughter) is born to him, but when the son (daughter) receives praise from the society, he will then experience true delight! When ten people praise the son (daughter) exclaiming, “O! (s)he is so good, (s)he is so good, (s)he is so good”, it is then that the father will be happy. God also will be happy then. You should get a good name from everybody. Such a good son (daughter) illumines the whole family with his / her light. What does Bhagawan expect from His Students? At Sathya Sai Institute, not even one naya paisa is being collected from you. Teaching is free, Library is free, Laboratory is free, Education is free, Games is free, Medicines are free. Everything is free. For having made you experience such an environment, for having taught you so many lessons, for having preached you so much wisdom, and for having done so much; what gratitude do you have in you? You do not need to give Swami anything. If you exhibit (manifest) the good qualities that you have learnt here, that is enough. If you cannot express gratitude, it is better to shut up and be quiet. But, never become ungrateful. Becoming ungrateful is a great sin. Students should correctly recognize such principles. It is not a great thing to merely study and pass. Swami has no happiness in that. You must pass, you must get a first class, you must get an “O” grade; but above all you must put all these into practice. That is what I desire. I do not desire anything else from you. When anybody sees you all, they must observe that these are the ideal students who have studied from that particular Institute. Once you go out, if you still roam around like a dog, people will remark, “O, he has studied from Sathya Sai Institute. But it looks like he has not given up his past tendencies. He has not left his past habits.” You must not earn such a bad name. Just wearing a white shirt when you go out is of no use. You must carry along with you a white (pure) heart. This is what you have to achieve. You must give happiness to the parents who have given birth to you. You must also pass on happiness to your relatives and friends. You must bring a good name to the Institute. Day and night, I am giving three fourth of My time to you, which I am not giving even to My devotees. Having got such an opportunity, you must not turn out to be ungrateful. Ingratitude to God is a very big act of ungratefulness. You live outside. You earn a salary. You acquire great wealth. What is the use? It is like decorating a dead body. Is wealth of prime importance? No, it is quality or virtue that is important. Students going out from Sathya Sai University are earning lot of money. This is a matter of great happiness. Make your parents happy. But do not get a bad name. Therefore, first of all control your tongue. So long as you are here you speak all good things. But once you go out, you live a contradictory life. Even a dog will not have such a bad mind. When somebody gives food to a dog, the next day when it sees the master, it will wag its tail and approach him with a sense of friendship. If after living so many days here, studying so many days here and having had so many experiences here; this friendship is not there among you all and there is no faith, then how can you be called human beings? You are then human beings only by form and not by practice. My aim and My desire is that you must become human beings by practice. My desire is that you must become ideal students. You should not speak just as you like. Many a time in life, we get into problems because of our (inappropriate) words. Today the times are very dangerous. Every word has to be thought over and then spoken. Every word should be spoken in an ideal manner. We should not feel jealous about anybody. We should not criticize anybody. You may correct your own faults if you wish to. Do not look at the faults of others. Take good from outside and throw out the bad from within you. These two are My wishes. You need to become ideal students. In the coming vacations, some among you are completing your education and going away, whilst others will return again. But whenever you go from the college to your homes, you must give lot of happiness to others and you must also experience lot of happiness. Never get into bad company. One of the boys who spoke said, “Satsangatve Nissangatvam, Nissangatve Nirmohatvam”. Join good company. Even if you have to pay money, do so, and get away from bad company. Even if you have to give up your life, do so and get into good company. Associate yourself with good company. Do not associate yourself with bad company. What will happen if you associate yourself with bad company? Tell me your company, I shall tell you what you are. You will also become bad, in the company of bad people. Therefore, run away from bad company and serve your parents. At times, your mother will go to the market. You too go with her. Carry the items purchased by your mother. How happy your mother will be! She will feel, “Oh, how much my son is serving me”. This is the happiness you must give to your mother who has nurtured you for nine months in her womb. Even while seeing your mother carrying all the items, if you sit on a chair and ask, “Oh, mother, when did you come?” she will think, “Oh, what a worse child has been born from my womb”. Therefore never give pain to your mother. Help your mother. Serve your mother. If your father is doing some work at home, ask him, “Father, do you want me to help you? I will surely do?” This should be the way and not simply sitting on a chair and whiling away all the time eating and sitting, eating and sitting. Enter the society and undertake service. Many of you, who know Bhajans, go and sing Bhajans. Or else, go and partake in social work. Go to the hospitals and help the patients. If you cannot do any other help, look out for poor patients and buy the medicines prescribed for them. If they are feeling cold, get them some clothes. But never give them money. If you give them money, India will become a nation full of beggars. Give them food, give them clothes, give them necessary medicines, and help them. This is the type of service you must participate in. If you undertake service in this manner, you will receive great repute. You will be fulfilling the human birth that you have taken. We have desires to become great. We have all sorts of desires. We wish to become another Birla, Kirloskar or Tata (great and reputed businessmen). You can become Tata (also means grandfather in most South Indian languages) by growing a beard (in lighter vein). Is that what you want? Reputation that comes from acquiring wealth is ephemeral (momentary). Do not sell yourself for money. You may earn wealth but use it in a noble manner, a good manner in a meaningful way. Sinful wealth will never stay with us. Either thieves will steal it or income tax officers will come and confiscate it. Therefore, rather than misusing your wealth, use it in a right manner. There are four custodians of wealth. One is fire, second is thief, third is friend and the fourth is the Government. They will take away your money. Before the money is lost, put it to good use. Our students should not desire or run after money in any matter, be it job or marriage. Work, work, work, work; aspire to work. As soon as you go home (from college after your studies), your parents will tell you, “Son, get married. We will get 10 lakhs of rupees”. Chhee (a remark indicating disgust)…can parents sell their son for the sake of money? The son has no shame nor do the parents have shame. Can the son be sold to a girl for the sake of 10 lakhs? Not just 10 lakhs, even if you get 10 crores of rupees, never ever allow yourself to be sold. You must stand on your own legs with your own strength. You must be self-reliant. But, without being so, if you follow whatever people tell you, then you are a slave. We must never be a slave. We must become the Master. When you become your own Master, then you can become a Master for all, setting an ideal for them. What is the consequence of being ungrateful to those who have helped us? If you cannot express gratitude, it is better to shut up and be quiet. But, never become ungrateful. Becoming ungrateful is a great sin. Students, you are all good. But, it is very essential to recognize this matter. Many people perform Surya Namaskaar* (salutation to the Sun God). While prostrating they chant “Himaghnaghnaaya Namah” (these expressions appear in the devotional hymn titled Adityahridayam, details of which are given at the end of this Discourse extract). The meaning of this phrase is that as soon as the sun rises the snow melts away. Therefore, we prostrate stating, “O Sun, as soon as you rise, you make the snow melt and flow as water; salutations to you.” Next, they say “Tamaghnaghnaaya Namah”. “Tamas” means “darkness”. “O Sun, as you rise, you put an end to the darkness; salutations to you.” As soon as the sun enters, the darkness disappears. These two are good expressions. They are fundamental Truths. But, there is a third expression, an extremely important one. “Krutaghnaghnaaya Namah”. What does this chant mean? “Krutaghnudu” means the ungrateful one. “O Sun, you move away from the ones who forget the help done to them; salutations to you.” If the sun moves away from such people, what is the loss to them? How does the sun reflect in an individual? The light (radiance) in our eyes is indeed the sun. Therefore, if we become ungrateful, we will lose the vision of our eyes. The sun (light) will move away from our eyes. We will become blind. That is the meaning of “Krutaghnaghnaaya Namah”. Students you know that even in the Vedas it is said, “Chandrama Manaso Jaataha”. The moon is equivalent to the mind of a human being. “Chaksho Suryo Ajaayata”. The sun is equivalent to the eyes of a human being. The radiance of the sun is there in our eyes. If this radiance leaves us, we will become blind. Therefore, the one who becomes ungrateful will lose his / her eyesight. For our life, our eyes are indeed the Saastras (scriptures). Drushti is Srushti, Vision is creation. We are losing this creation. We are losing the scriptures. We are losing our very human life. For every act there is some fruit and some atonement. But there is no atonement for being ungrateful. Whatever Sadhana (spiritual exercise) one may do, it is of no use (to atone for ingratitude). Even if you lose your life, it would be of no use (to atone for ingratitude). Therefore, never become ungrateful. Students need to recognize these principles correctly. * Surya Namaskara also known in English as Sun Salutation is a common sequence of asanas. Its origins lie in India where its large Hindu population worships Surya, the Hindu solar deity. This sequence of movements and asanas can be practiced on varying levels of awareness, ranging from that of physical exercise in various styles, to a complete sadhana which incorporates asana, pranayama, mantra and chakra meditation. Adityahridayam is a devotional hymn associated with Aditya or the Sun God (Surya) and was recited by the sage Agastya to Rama on the battlefield before fighting the demon king Ravana. This historic hymn starts at the beginning of the duel between Rama and Ravana. Agastya teaches Rama, who is fatigued after the long battle with various warriors of Lanka, the procedure of worshiping the Sun God for strength to defeat the enemy. These verses belong to Yuddha Kanda (Book 6) Canto 107, in the Ramayana as composed by Agastya and compiled by Valmiki. Salutations to the dispeller of darkness, the destroyer of cold, fog and snow, the exterminator of foes; the one whose extent is immeasurable. Salutations also to the annihilator of the ungrateful and to the Lord of all the stellar bodies, who is the first amongst all the lights of the Universe. Do we need to give up this world to earn the Grace of God? The king enjoys the pleasures in the privacy of the inner rooms of his palace. The dog enjoys the same pleasure in the market. Is this true happiness? Saint Tyagaraja put forth a very fundamental question to his mind, “O mind, tell me truly, what gives real happiness; this wealth or the proximity to the Lord?” Happiness does not lie in merely getting academic degrees. Earning lot of wealth does not give happiness. Getting into positions of authority does not give us happiness. We need to earn the Grace of Iswara, the Lord. That gives true happiness. However, until we reach that state, we need to live in this world with integrity and morality. The aim should be that (earning God’s Grace), but action should be performed in the world. Experience Nature through the vision of spirituality: this is the profound message of Sai. You do not need to give up Nature (world). You do not need to resign from your job. You need not struggle to get a new or a different job. You do not need to beg for a job going from office to office like a dog. Do the job that you have in your hands. Look after your family well. Lead an ideal life. But always keep the right aim (to earn the Grace of the Lord). Students need to clearly recognize and practice this truth. This is real bliss or joy! What are three important things that we should never forget in our life? Never forget God. Do not trust the world. Do not fear death. You need to understand these three things. Do not trust the world. Why? …because it changes from moment to moment. How can you trust it then? You must have such courage. If you learn these three things, the whole world will be in your hands (within your control). Swami too will be in your hands (in your control). How do we understand symbolism in the worship of God? The atomic power is present everywhere. Scientists refer to this entity as the atom, as a minute particle. However, the atom too can be split further into smaller particles that have a form. There is nothing in this world, which does not have a form. Everything assumes some form. Now take for example the state of Karnataka. What form does this state of Karnataka have? If you look at the map, you will find a form or a shape for the state of Karnataka too. Similarly, what form does Andhra have? Andhra too has a form on the map. What is it that does not have a form? If we cross the border of a state, one is considered to have transgressed the boundaries of the state. How exactly can we define the boundary of a state? If we think in this manner, we will realize that every material in this world has got a form. This is why the ancients considered Goddess Earth to be the true deity and started worshipping her. However, few scientists made fun of them. They thought, “What is this? They consider Mother Earth as God! After all what is there in this earth? There is just mud and stones”. They asked, “What is the inner significance in worshipping this mud and these stones?” They replied, “Sir, it is this very earth that gives us food to eat. It is this wind which gives us life. It is the sun that helps us to cultivate crops. Therefore, none can say that worship of Nature is erroneous. Worshipping the one who has helped us and the one who has put an end to our suffering is correct. It is the Truth and the right path”. The five elements are helping us so much. If there are no Pancha Bhootas (five elements), then there is no Prapancha (creation). What is the loss in worshipping these five elements? Leave alone the five elements; there are some who worship mere stones. How can a stone be treated as God? O fool, everything is the form of God. Why should one not worship it? One may say, “The stone has no attributes and it has no life. Why worship something which is just fallen as a lump with no awareness?” You need to clearly recognize one aspect here. On the 15th of August (Independence Day in India), we hoist the National Flag. We all salute the flag and respect it. Why do we respect the flag? It is after all a small piece of cloth woven with threads. It has no attributes nor has it any awareness. If there is breeze, it flies, else it remains still. How do you respect such a flag, which has no awareness? What qualities are present in the flag? (Truly speaking) You give a stamp to the flag as a symbol of the freedom that has been acquired through great struggle. That is Divinity! It is all about symbolism, belief and faith. In every nation, people respect the National Flag. China and Russia too respect their National Flag. When we worship the flag that has no awareness, what is wrong in worshipping entities like a stone that has no awareness? Divine awareness is present everywhere. However, there are certain signs and symbols. When we enquire like this, the argument of the atheists does not hold good. Today, in this world, in our daily life, there is something that we experience everywhere. We worship this wealth, Lakshmi Aradhana (worship of the Goddess of wealth). We worship Goddess Lakshmi by applying kumkum (vermilion), turmeric and lighting incense sticks. If we see a Rs.100 note, we touch it to our eyes and keep it in our pocket. What is this rupee note after all? It is made from bamboo and grass pulp. What attributes are there in this rupee note? What awareness does it have? Then why do you worship this note? The rupee note is worshipped by theists as well as atheists. Do atheists say that they do not want the Rs.100 note? They too want it. They all attach value to it because of the stamp on the note. You have a father and a grandfather. After his demise, you would worship his photo and light incense sticks. What is there in this photo? Is your grandfather there in that photo? No, it is just a picture on a paper. True, it is just a paper, but it has the picture of your grandfather on it. Similarly, it may be a mere stone, but the deity meant for worship is present in it. The form based on one’s feelings is embedded in it. If we think in this manner, everything will appear as God’s Form to us. No one has the authority to criticize (this form of worship). If you do not like, you may abstain from it. But it is very wrong to harm the faith of others. You experience your faith. Leave the faith of others to them. Each one will have their own faith. Each one has to breathe for himself. If you were to ask someone else to breathe for you, would it be possible? This is impossible. When and how can we have the Vision of God? Some people in this Kali Yuga, approached Ramakrishna Pramahamsa. They asked him, “Swami, have you seen God?” He replied, “Yes, I have seen”. They asked, “In what way have you seen God? In what form have you seen God?” Ramakrishna replied, “I have seen God just the way I see you and you see me”. They queried, “How is this possible?” He replied, “Yes, it is possible. The kind of worship and yearning that one needs to see God is not there in you. O People, you crave for property, wealth, conveniences and comforts. You work so hard for your wife and children (family). You shed tears for the smallest to the biggest issues. You cry day and night for earning money. But, have you ever cried like this for God? The time that you spend in worrying out of attachment for your children, friends and business; the time that you spend in thinking of wealth, comforts and reputation; of that, do you spend even one second concentrating on the feet of the Lord? Once you experience that contemplation, even the fearful doors of the Lord of death Yama, will be open for you. You struggle with worrying for the world, but you aspire for the vision of the Lord. This is impossible my son. Pine for that which you desire; only then the Lord will be available to you. You say one thing and you act in a different way. Under these situations you will never be able to recognize God. Can God be perceived through mere empirical investigations? Today with respect to God, the atheists, the Cārvākas (one of the heterodox schools of Hinduism, that rejects supernaturalism, emphasizes materialism and philosophical scepticism; holding empiricism, perception and conditional inference as the proper source of knowledge) and the scientists, based on their deliberations, came up with the idea of direct proof or empirical evidence. It must be possible to see with the eyes, touch with the hands and taste with the tongue. Only then one could believe in the existence of something. How can one believe in a power that cannot be seen, cannot be grasped by the hand and cannot be tasted? Scientists consider people who still hold such beliefs as foolish people. Truly speaking, in this matter, if the scientist claims that direct proof or empirical evidence is the only way to believe in the existence of something, then there is no greater fool than him. How can we say this? Let us say an individual is seen by the eyes. His height is 5’ 6” as measured by him. His weight as observed in the weighing machine is 63 kgs. The weight in kgs is direct proof as it is seen in the weighing machine. His height too was measured using a tape and found to be 5’ 6”. He is seen with the eyes. He has a moderate complexion and a bald head. All these are direct proof or empirical evidence. Is this all true? Yes, it is true. But in what context is it true? It is true for all the external characteristics such as height, weight and colour. But there are so many qualities in the individual that cannot be seen by the eyes, cannot be grasped by the hand and cannot be measured. There is compassion in him. There is determination in him. There is sacrifice and forbearance in him. But all these qualities are not visible to the eyes. They cannot be measured by a tape or cannot be weighed by a weighing machine. Even if the individual were to be cut into pieces, these qualities would not be visible to the eyes. But can we say these qualities are not there in him? It is only with these qualities that the individual becomes functional and useful. Because of the non-apparent aspects only the apparent aspects become functional. That is why the non-apparent can be visualized through that which is apparent. O fool; that which is not seen is considered as a dream and that which is seen is considered real. But that which is not seen is the one which is responsible for humans to experience all their Karma (destiny – consequences of actions). Therefore, it is foolishness to refuse to believe and deny that which cannot be seen or that which cannot be grasped by the hand. It is also foolishness to consider that what can be seen alone as real. A tree is full of branches and is visible to the eye. We say it is true (real). Scientists focus on the multiple branches, flowers and fruits on the tree. But a spiritual person focuses on the roots that cannot be seen by the eyes. If there are no roots, where can there be any branches? The one who sees the branches does not see the root and the one who sees the root does not see the branches. Which among these is more important, the branches or the roots? If the branches are cut and the roots remain, the tree can grow again. But if there are no roots, we cannot have any branches. Therefore, because of the roots that are not visible to the eyes, we are able to see the multiple branches of the tree. Similarly, for this creation that can be seen, there is an invisible Divine energy that is the basis. Basing on that Truth (energy) only, we are able to perceive the world. A few more examples: We have fragrance. We have love. Love has no form. Fragrance too has no form. But we do experience them. Can we say they do not exist? These cannot be seen by the eyes, cannot be grasped by the hand and cannot be tasted by the tongue. How then do we have belief in them? This means, for that which is not seen, there is something which is seen and forms the basis. Love has no form but the mother who loves has a form. Fragrance has no form but the flower that gives the fragrance has a form. In the same way bliss has no form but God who bestows bliss has a form. What is that form? This form is incomprehensible, hidden and can take any shape. With hands, feet, eyes, ears, head and mouth pervading everything, He (Divine Being) permeates the entire universe ! Whatever feelings the devotee entertains, God assumes a form accordingly. He is everywhere. What are the parallels we can draw between a football game and human life? Many children play football. How long does the football get kicked around? Members from both the teams keep kicking the ball. The ball cannot escape the kicks of the players. How long can it not escape? So long as there is air in the ball, it will receive kicks from players of both the teams. Once the air is lost (ball is deflated), the ball is taken into the hands. In the same way, this human life is like a football game. There are six players in each of the two teams: six wicked players on one side and six good players on another side. There is a constant conflict between the evil and the good. The war and the fighting continues always. Who are these six players? Kaama (Desire), Krodha (Anger), Lobha (Greed), Moha (Attachment), Mada (Pride) and Matsarya (Jealousy) are the six wicked players. Sathya (Truth), Dharma (Righteousness), Shanti (Peace), Prema (Love), Ahimsa (Non-violence) and Prakruti Dharma (Law of Nature) are the six good players. Six on one side and another six on the other side keep kicking the ball. But there is a goal post for the game. The goal post is set between two poles. Only when the ball goes between these two poles it becomes a “goal”. If it does not go between the poles it becomes an “out”. This is akin to Ihamanu Sukhimpa Hemataaraka Vidya, Paramunu Sukhimpa Brahma Vidya – i.e. secular education is necessary to keep us happy here in this world and spiritual education is necessary to keep us happy in the world thereafter (beyond death of the body). These two are the limits for our life and we need to move between them. When we hit the “goal” of our life between these two poles, we will be able to attain Divine victory. When our life is not led between the secular education and spiritual education it becomes an “out”. What happens then? It leads to Punarapi Jananam Punarapi Maranam, i.e., birth again and again, death again and again. But if life is led between the goal posts, then Punar Janma Na Vidyate, i.e. there will be no rebirth. No birth, no birth. Only when there is birth, there will be death. When there is no birth, where will death come from? This is called Moksha. It will never become a seed again. We should recognize this Truth. What is the true meaning of Paropakaar? We must continuously engage ourselves in sacred actions. In the world many consider meritorious acts as providing conveniences to others or helping others or engaging in charity and righteous acts. But Sage Vyasa did not consider these as meritorious acts. He stated, “Paropakaaraaya Punyaaya”, and people assumed the meaning to be “service to others is merit”. But this is not the true meaning. “Para” + “Upa” + “Kaara” is “Paropakaara”. “Para” means “Divinity”. “Upa” means “close to” or “in the proximity”. “Karaa” means “to go”. This means that going closer to Divinity is true Punya (merit). True merit consists in the devotee going closer to God. Kuru Punyam Ahoraatram - Such meritorious acts must be performed throughout the day and night. What are the specific roles played by Lord Rama and Lord Krishna as Avatars? Among the principle of the Avatars, the easiest path, the sweetest path, the most wonderful experiences are found mainly in the Krishna Avatar alone. But that does not mean that the other Avatars were any less. Every Avatar’s life is appropriate to that time. Here is a small example: Some two people started a fight in the bazaar (market). Seeing the brawl, a policeman arrived at the scene. But the fight became serious. So, the Superintendent of Police (SP) arrived there. However, the fight became all the more serious and it came to a point where each one was trying to kill the other. To handle the situation, the Inspector General of Police (IGP) came over there. To start with the policeman comes there, subsequently the SP comes there and thereafter the IGP comes to the scene; why all this? As the lack of peace increases in its proportion a person with a higher designation needs to come over there. Since in the times of the Rishis, the practice of Dharma diminished; to enhance the practice of the same and to protect and promote the welfare of the Dharani (Mother earth), Dharmapatni (consort or the wife) and Dharma (righteousness), the Rama Avatar took place. But when the Krishna Avatar took place, the demonism had increased all the more. Therefore, it was considered to focus all the attention only on Dharma and it was not critical to focus on Dharani (Mother earth) and Dharmapatni (consort or the wife). Once Dharma is protected and established, the welfare of the Dharani (Mother earth) and Dharmapatni (consort or the wife) is also ensured. That is why Rama is regarded as Maya Manusha Vigraha (embodiment of Maya or delusion) and Krishna is regarded as Leela Manusha Vigraha (embodiment of Leela or Divine sport). In the story of Lord Rama, Rama has been depicted as an individual bound by Maya, as one who wept for His consort, and as one who cried for the sake of a lady. But the Krishna Avatar is not like that. In the story of Krishna, all women cried for the sake of Krishna. It is just the reverse story! In the Rama Avatar, Rama went forward to wage a war only when provoked. When Ravana and the other wicked people took to the wrong path, Rama entered into a war with them out of compulsion. But the Krishna Avatar is not like that. Krishna would Himself provoke the demons and then engage in a fight with them. In Rama Avatar, it was first action followed by a smile. In Krishna Avatar, it was first a smile and then action. Looking at it this way, one can recognize the difference between a Maya Avatar and a Leela Avatar. Krishna was always in bliss. Be it a burial ground, a safe place or a battlefield, He was in bliss everywhere. The war was about to commence. On one side there were 11 lakh warriors and on the other side there were 40 lakh warriors. Krishna was standing between the two armies and He was singing the Gita! “Gita” means a song. Can anyone sing a song under these circumstances? Normally, we sing a song only when we are happy. If we are happy, we sing a song even in the bathroom. Bliss or joy is the basis for singing a song. Since Krishna was the embodiment of bliss, He sang a song even in the battlefield. Therefore, happiness is union with God. Divinity lies in bliss. Do we need to go to the forest to seek peace? To think that one can attain God through Dhyaanam (meditation), Japam (chanting the Divine name) or Tapam (penance) is merely an illusion. All these may give only temporary peace for that moment. To get eternal peace or eternal joy, we need to develop Divine feelings within us. But for this you need an appropriate environment too. Only in a Divine environment and sacred surroundings you can get such feelings. Elsewhere, you cannot get such opportunities. That is why in ancient times, sages went to the forest, sat in an isolated silent place and developed a Divine environment around them. This is because they thought that in the village (or town or city) their vision and their hearing would become unsacred. It is this weakness that led them to go to the forest. But we need not go to any forest. We must recognize the Divine principle resident in our own heart. Today, you may go and sit in the forest but your intellect (or mind) may roam around in the city. That is “forest”, while this (your heart) is “for rest”! Your peace lies within you and not outside you. In such a sacred proximity and environment (of the heart), you can further develop your peace. What is the difference between Science and Spirituality? Science, science, science – this is modern education. The study of science is essential, but how should it be? Today, science is taking us in the wrong direction. It starts from a point and stops at a point (Swami draws the outline of a “C” in the air). This “C” stands for science. Like the letter “C”, science starts at one point but ends at another point. It is not a full circle. But spiritual education is like a full circle. It ends at the point where it starts. That is whole. That is complete. That is sacred. But science is not complete in that sense. Like the letter “C”, it starts at one point and ends at some other point. There is a wide gap in between, like an abyss. You will fall into that. “What is this” signifies closeness. “What is that” signifies distance. We desire to seek only “this”. “This” means it is very close. “That” means it is very far. That which is far away from the senses is spirituality and what is near to the senses is this world. The world is so near to the senses, but it is not dear. That which is far (spirituality) is dear. Here is a small example where you can see (the truth) for yourself. You all came here to see Sai Baba, from distant lands like Zambia and East Africa. As you live so far, your love has developed so much that you yearn to come here. To go to a village just next to your place, you would not have such a yearning. We tend to neglect what is very near to us. We cultivate interest in that which is far away from us. Therefore, seek “What is that?” That means beyond the senses. The true science is beyond the senses. What is below senses is just dirt. So, we must not go below the senses. We must go beyond the senses. Then we will be able to lead a sacred life. Students of today live below the senses. They live close to the senses and become slaves of their senses. They succumb to their senses. This is not true education. In fact, we must control our senses. We must be the master of our senses. That is true culture. Today, we do not need to go beyond the senses. To not think of the senses itself is a great science. Today, right from the time we wake up to the moment we sleep, we are lost in senses, senses and senses. This is a very dirty life. We must not succumb to our senses. Senses are our servants. We must not be slaves to our own servants. We should be the masters and the senses must be our slaves. Many of you know this story. In the Ramayana, Kaikeyi was a great queen. She was the daughter of the King of Kashmir. She had great titles and was an expert in all forms of knowledge. She was indeed the queen. A maid servant came to assist her. Her name was Mandhara. She was a servant. But Kaikeyi made Mandhara her master. Finally, the queen became the servant of Mandhara. What happened at the end? Because Kaikeyi became a servant to her own servant, her life was ruined. She lost her position. She became the victim of the anger of her son. She sent the sacred Rama to the forest. She made the noble Sita cry. This was her pathetic plight at the end. She too got ruined along with the others. Therefore, a servant should be kept only as a servant and a master should be kept only as a master. The Gunas (qualities) are not our masters, they are our servants. We are its masters. Master the mind and be a mastermind. What is the real Watch? I keep telling many of My students, the spelling of watch is W A T C H. First of all students must be taught about this W A T C H.
The first letter is “W”. It stands for “Watch your word”. We need to keep a watch: Am I making use of sacred words? Or am I making use of bad words? The second letter is “A”. It stands for “Watch your action”. The third letter is “T”. It stands for “Watch your thought”. The fourth letter is “C”. It stands for “Watch your character”. The fifth letter is “H”. It stands for “Watch your heart”. This is the real WATCH. We consider the wrist watch as a watch. That is not the real watch. The wrist watch is likely to spoil at some time. But this acronym of WATCH will never get spoiled. It will always confer sacredness. What a sacred word it is. Therefore, we must assimilate (the essence of) such ideal good words. How can we win the Grace of the Lord? So long as we live in society, we need to follow social discipline. Living in society is like a business. A businessman started a business in a village. Ten members got together for the business. Each one of them invested an equal share in the business. They went on with their business. The profit they earned from the business was shared equally among them and so was the loss. Similarly, in this society we are all members. When all of us develop and nurture sacred feelings and thoughts we will earn very good profit. Each one of us will earn an equal share of the profit. We are all shareholders. In the business of (earning) God’s Grace, each one of us is a shareholder with equal rights. We must prepare ourselves as shareholders. Where? In the bank of God’s Grace! There is lot of money in the bank. But none can even touch it. You are only a guardian. The guardian has no rights. You can only help. When you go to a bank, you find a cashier. All the money in the bank goes through the hands of the cashier. But thinking that the money is in his hands, the cashier cannot assume the right to touch even one naya paisa (lowest denomination of currency – one hundredth of a rupee). He can disburse cash only to the one who presents a cheque. In the same manner, in the bank of God’s Grace, God has nothing to do with the cash (of Grace). God has nothing to do with all this money and business. 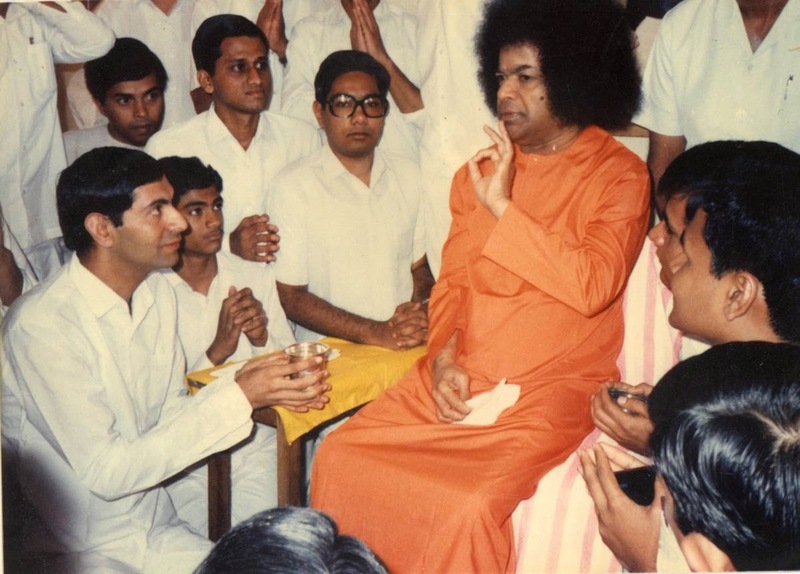 But when you present the cheque of the fruits of your Sadhana (spiritual pursuit), God disburses the cash of His Grace! There are three methods of withdrawing money from a bank. If you need money from the bank, you should have deposited some money earlier in the form of a fixed deposit. Only then, you will have the right to receive your money back. If you have not deposited any money earned by you in the bank, you may ask for a loan. In this case, you can mortgage your permanent assets and take some money (as a loan). If this is also not feasible, and you still need money, you can take along with you a wealthy individual as a guarantor and seek loan on that basis. Guru is verily the Para Brahman, My salutations to such a Guru. Can we escape the consequences of our actions? Human beings are born in action. They grow and finally die in action. Action is verily Divine. Actions are responsible for pleasure and pain. Action expresses itself in three different ways. The thinking process is one form of action. Expressing one’s thoughts in words is another form of action. Translating the expression of words into action is the third form of action. Thoughts represent the mind, words the mouth and action the hand. Therefore, human life is a combination of the principle of the body (action), the mouth (word) and the mind (thought). These three are responsible for all the joys and sorrows of human beings. Humans have no existence without these three (thought, word and deed). Whatever actions we perform or feelings we entertain, we have to face the consequences of it. What we need to recognize today is that each one has to face the consequences of his / her actions. As is the tree so is the flower, as is the food so is the belch. You cannot escape the consequences (of your actions). However, with God’s Grace you can achieve anything. Human beings have to struggle to earn Divine Grace. Some time or the other, we would have to face the consequences of our actions. Here is a small example: There are few actions whose consequences are to be faced immediately. There are other actions whose consequences have to be faced after a few minutes. There are also actions whose consequences have to be faced after a few days and there are those whose consequences appear after a few years. And there are some actions whose consequences have to be faced even after ages. When we run and our leg slips, we face the consequences of the action immediately in the form of a fracture. Slipping and sustaining the fracture happen in immediate sequence. When we do some (cutting) work, the knife may cut our hand. The moment the knife strikes, the blood flows. The flowing of the blood is the immediate consequence for the action. In the second type of actions, the consequences appear after a few hours. The food that we eat in the morning gets digested after about two hours. This action (of digestion) takes a few hours. Suppose we sow a seed in the earth, it takes a few days for it to sprout. For the sapling to become a tree, it takes a few years. For the tree to yield fruits, it takes even a few more years. In this way, the consequences of actions may manifest in a few minutes, hours, days, months or even years. However, there are a few foolish people who claim that they have done many wrong things, but have not faced any wrong consequences thereafter. But the consequences are there. They will come in the future. One can never escape the consequences of their actions. Among actions, there are three types of actions. Sukarma, Vikarma and Akarma. Sukarma means the consequences of good actions. It is performing good actions, whose results will always be good. Vikarma means performing bad actions, whose results will always be bad. Akarma means even without performing any actions, one faces certain consequences. These can be understood as consequences of the actions performed in the previous births. (For example) Mother Sita did not perform any bad actions. But what caused her to stay in the forest and suffer in the separation of her husband at Ashoka Vana? King Satya Harischandra did not perform any sinful actions. But why had he to sell his wife, lose his son and serve as the watchman in the burial ground? What is the reason for King Nala and Damyanti to be separated from one another and live in sorrow? This is neither Sukarma or Vikarma. This is Akarma. Even if one does not perform any actions currently, one would have to face the consequences of actions performed in the previous births. We must make an effort to recognize this uniqueness in humanity. Whatever we may experience, however small or insignificant it may be, it is the result of our own actions. We can never escape this. Since we cannot escape the consequences of our actions, we need to make an attempt to overcome them by praying for and deserving the Grace of the Lord. We should make every effort in this direction. What are the criteria for classification of people into Varnas? Every being born in this world has a mix of Tamo (sloth, dull, inactive), Rajo (action, restlessness, passion) and Satva (pious, pure, balance) Gunas (attributes). All their actions are based on their Gunas. It is on this basis that the Gunakarma Vibhaga is done (original sloka from the Bhagavad Gita given at the end of the discourse excerpt), i.e. beings are categorized based on the Gunas and activities. When man is born, he is ignorant. When he dies, he dies (or rather should die) as a Jnaani (a wise one). Similarly, when a man is born, he is always born as a Shudra, meaning he is ignorant. But being born as a Shudra, he must die as a Brahmin. It is on this basis that the four Varnas came into existence. Based on these three qualities, three categories of people have been identified. The first category of people consists of those who are foolish. The second category of people consists of those who get angry and agitated. The third category of people consists of those who are totally selfless, having given up everything and full of purity. Therefore Shudra is a one with Tamo Guna. He is foolish and dull headed. Kshatriyas are the ones with courage, valour and heroism. Brahmins are the ones with qualities of devotion and attachment to God, sacredness and total purity. It is on the basis of these Gunas that the castes were formed. But not recognizing this sacred Truth and Dharma, man has started following the wrong path. Today on account of differences in castes and community, individuals, like dogs, are attempting to shatter humanity into pieces. One can never say that some are high and some others are low. One can never identify one as a lower caste and the other as a higher caste. Here is a good and appropriate analogy. The entire Vedas that were one whole, were classified into four Vedas by the great sage Vyasa. Can one ever say that one of these Vedas is great and the other is not? No. All the four Vedas are equal. All the four Vedas are sacred. All the four Vedas teach people to practice selfless actions. Similarly, as the division of castes have been made on the basis of the Gunas, no one has the right to identity one caste as high, another as low or yet another as medium. It is only because of narrow mindedness and because of the lack of capability to understand this concept that man is experiencing this caste system in a distorted manner. According to the three modes of material nature and the work ascribed to them, the four divisions of human society were created by Me. And, although I am the creator of this system, you should know that I am yet the non-doer, being unchangeable.